Obverse: Bust of the young Queen Victoria, shows her wearing the new Imperial State Crown, and with a long hair braid, wearing a dress richly embroidered with roses, shamrocks and thistles. The engraver's initials W.W. for William Wyon, appear raised below the shoulder. The obverse inscription appears in gothic style script, in upper and lower case. Reverse: Crowned cruciform shields bearing three lions passant for England, lion rampant for Scotland, and harp for Ireland. In the angles are roses, a shamrock and a thistle. In the centre there is a flower motif. All contained within a tressured circular panel. The reverse legend is also in lower case gothic style script, except for the "O" of "One": ONE FLORIN - ONE TENTH OF A POUND. References: KM# 746, Sp# 3891-3901. The Gothic portrait was a beautiful medieval style portrait of Victoria facing left by the engraver William Wyon. Crowned, with a long braid which sweeps low under the ear and tucks into the back of the crown. The tip of the crown cuts through the border design of small crosses. Victoria is wearing a dress richly embroidered with roses, shamrocks and thistles. The inscription around the coin is in a medieval gothic style font in upper and lower case. This in itself is quite unusual, in that most coin inscriptions are in upper case (capitals) only. The 1847 Gothic Crown was the first British coin to feature a monarch wearing a crown since the silver coinage of Charles II. The gothic design was first used on the beautiful gothic crown of 1847. After the disaster of the "Godless" issue in 1849, the gothic design was used on the new florin coin. It continued with a number of minor changes until 1887. 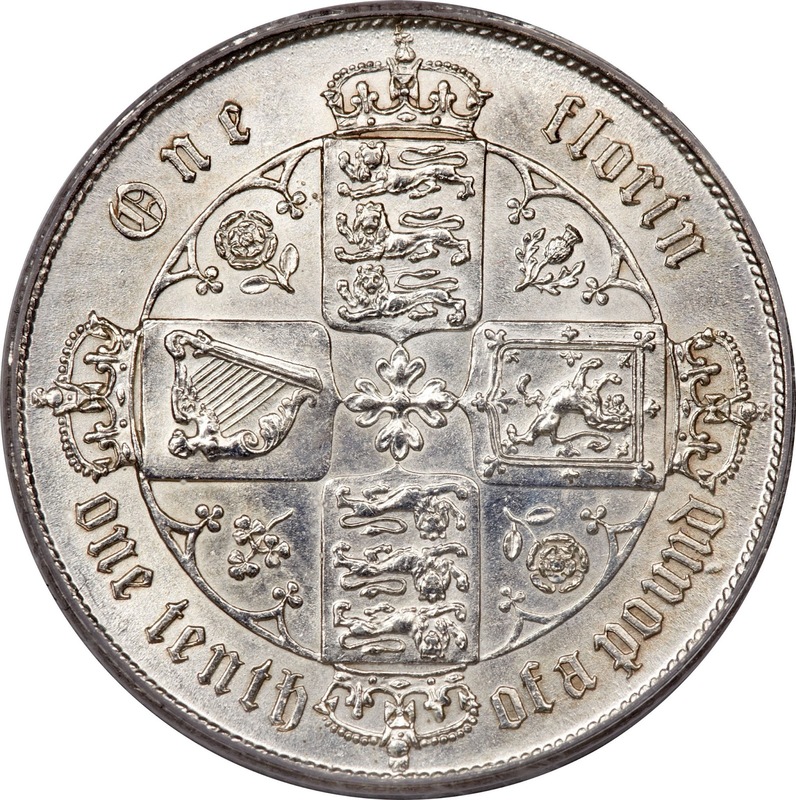 The British two shilling coin, also known as the florin or "two bob bit", was issued from 1849 until 1967. It was worth one tenth of a pound, or twenty-four old pence. It should not be confused with the medieval gold florin, which was nominally worth six shillings. In 1968, in the run-up to decimalization, the two shilling coin was superseded by the decimal ten pence coin, which had the same value and initially the same size and weight. It continued in circulation, alongside the ten pence coin, until 1993, when the 10p was reduced in size. In 1847 a motion was introduced in Parliament calling for the introduction of a decimal currency and the striking of coins of one-tenth and one-hundredth of a pound. The motion was subsequently withdrawn on the understanding that a one-tenth pound coin would be produced to test public opinion. There was considerable discussion about what the coin should be called, with centum, decade, and dime being among the suggestions, before florin was eventually settled upon, partly because of its connection with old English coinage, and partly because other European countries also had coins of approximately the same size and weight called florins. 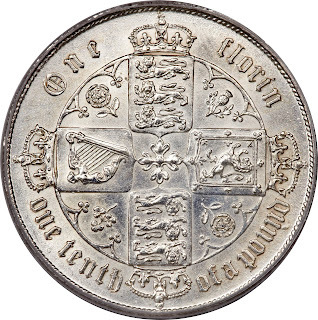 The first florins were struck in 1849 as silver coins weighing 11.3 grams and having a diameter of 28 millimetres. These first coins would have come as rather a shock to the public, as for the first time in nearly 200 years a British coin featured a portrait of the monarch wearing a crown. 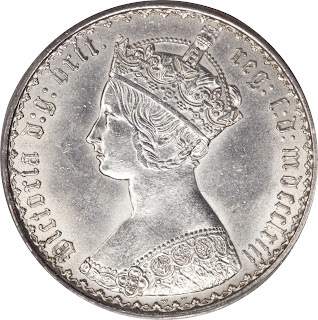 Even more of a shock, including (allegedly) to Queen Victoria herself, was the omission of D G – Dei Gratia ("by the grace of God") – from the coin's inscription, which resulted in it being popularly known as the godless florin. The inscription around the obverse read VICTORIA REGINA 1849. The reverse featured four crowned cruciform shields with a rose in the centre, with the shields separated by a rose, thistle, rose, and a shamrock; the inscription on the reverse was ONE FLORIN ONE TENTH OF A POUND. The "godless florin" may have also been minted in 1850 and 1851 with the date 1849. In 1851, the florin was redesigned in a most unusual way. The diameter was increased to 30 millimetres, and all the lettering on the coin was in Gothic script, resulting in it being known as the Gothic florin. The date was rendered in Roman numerals. The inscription on the obverse read (e.g.) victoria d g britt reg f d mdcccli ( F D – Fidei Defensor, defender of faith), while the reverse read one florin one tenth of a pound. The Gothic Florin was produced each year until 1887 (mdccclxxxvii). In 1887, to commemorate Queen Victoria's Golden Jubilee, a new older "Jubilee Head" of the queen was used and the various flora were removed from the reverse and replaced by sceptres between the shields and a Garter Star in the centre. The diameter was reduced to 29.5 millimetres. All the inscriptions were in Latin letters and Arabic numerals. The inscription on the obverse read (e.g.) VICTORIA DEI GRATIA, while the reverse read FID DEF BRITT REG date, with no indication of the value. The Jubilee Head issue was released each year between 1887 and 1892. 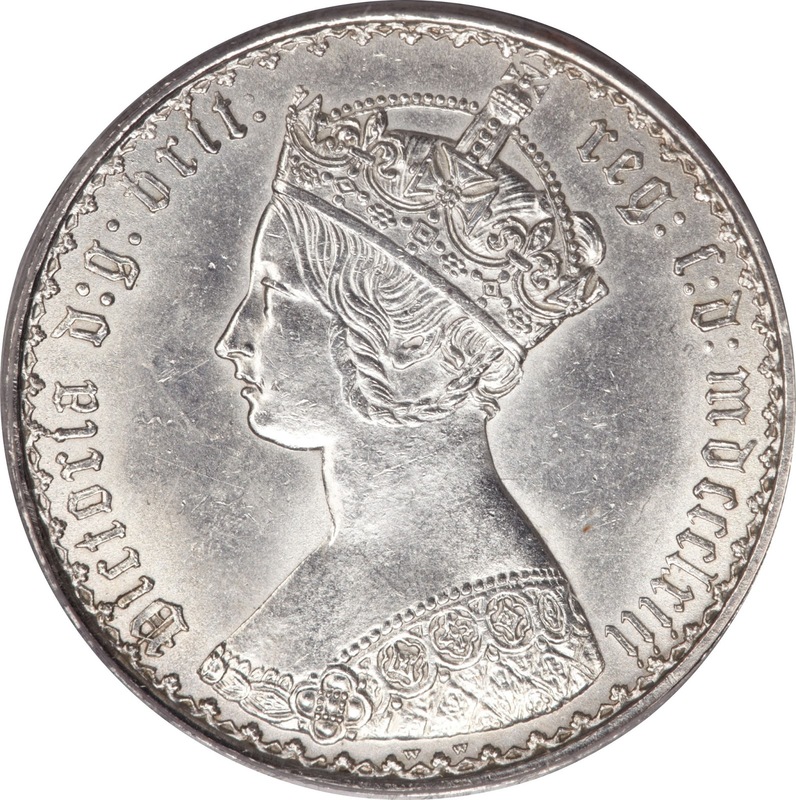 In 1893, a new "Old Head" showing the veiled head of the queen was introduced, inscribed VICTORIA DEI GRA BRITT REGINA FID DEF IND IMP, together with a completely new reverse showing three shields separated by a rose, shamrock, and thistle surmounted by the Garter crown and inscribed ONE FLORIN TWO SHILLINGS. The diameter was reduced again, to 28.5 millimetres. This issue was released each year between 1893 and 1901.